TradePort's advanced marketplace management systems provide a centralized toolset to sell products across multiple e-Commerce marketplaces. Our tools can be designed to support your own branded storefront, a TradePort Microsite or anonymous presence. This flexibility provides your organization the ability to bolster sales by associating the purchasing experience with your well recognized brand name or minimize channel conflicts by anonymously making products available through a generic or TradePort branded storefront. TradePort's StoreFront Management service provides our clients with the best possible selling environments for eBay, Amazon, Rakuten, Sears, Newegg and other popular selling platforms by exercising our strong e-Commerce techniques and StoreFront designs. So if your organization is interested in capturing and fulfilling sales through these commerce sites, but don't have the resources to manage the design, implementation or daily caring of the environments in a professional manner, we can help! Exposure to these marketplaces is only the beginning, TradePort also offers award winning customer pre & post sales support for all products that we represent. Our customer service team has gained TradePort recognition by eBay and Amazon as a Platinum Reseller, a certification that can only be had by providing industry leading customer support. Image & Descriptions to Spec. TradePort web design professionals provide a professional and brand compliant look and feel to your MarketPlace storefronts. By creating and updating your storefront, your organization can build customer confidence and increased average sale price. Increased average sales price? Yes, studies have shown that customers will pay more for a product when the seller has a HIGH seller rating and professional presentation of the products. Poor listings and low ratings discourage customers from purchasing products, based on other customer feedback. Our web design professionals create storefronts that meet your corporate branding requirements and that you can be proud of! In addition to branding your storefront, it's important that the presentation of each product is as professional as your storefront! TradePort's skilled eCommerce merchandising professionals provide detailed product descriptions, professional images and well organized templates for each and every product. When it comes to eCommerce, "content" is king in encouraging customers to buy! As one of the most popular consumer electronics and highest ranked resellers on eBay, TradePort offers your organization the opportunity to promote your products within a microsite directly on our primary TradePort Storefront. 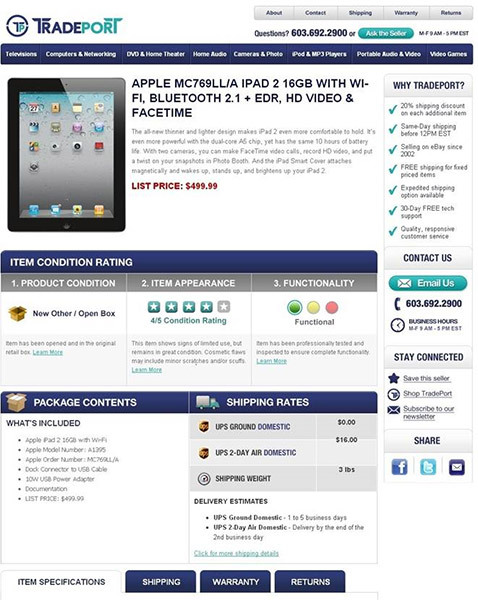 This exposes our thousands of loyal customers to your products everyday as they visit our site to discover what's new! TradePort's team of web design professionals will create a MarketPlace you can be proud of! 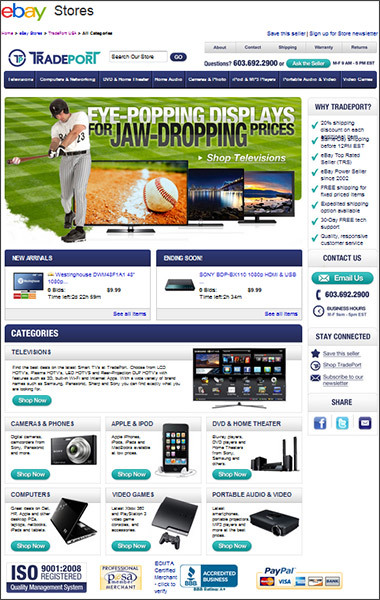 TradePort's team of web design professionals provide detailed product listings.